The Sigma 60-600mm f/4.5-6.3 DG OS HSM User Manual is available for download. According to Nikon Japan, the Nikon NIKKOR Z 50mm f/1.8 S's release – originally slated for availability in late October – has been delayed until mid December. The Gitzo Mini Traveler is especially dedicated to professional photographers and promising amateurs who use mirrorless cameras or DSLR cameras with small lenses. 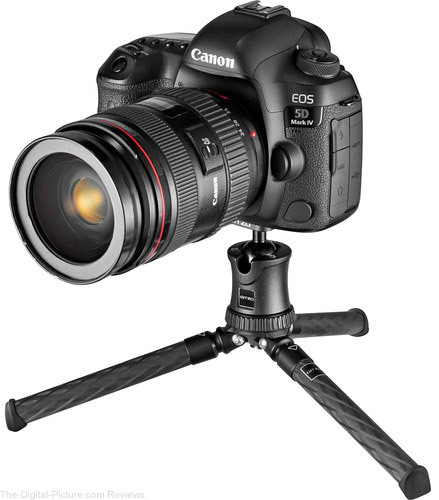 This mini tripod provides great stability on a tabletop as well as on the ground and many other surfaces, unleashing photographers’ creativity without the hindrance of cumbersome equipment. It is the perfect photographic travel companion for those who want to travel light and fully equipped with reliable accessories, as it fits any photographic bag without taking up space needed for the main imaging gear. The Gitzo Mini Traveler provides convenience and functionality during every outdoor photographic project. Thanks to its state-of-the-art carbon eXact tubes and aluminium head, it weighs only 265g (117g legs only) enabling photographers to always take the best performance with them wherever they go. It is built of premium materials from the plate to the feet, ensuring always the best reliability. The machined aluminium spider and head are strong and dependable, supporting up to 3 kg in fully splayed configuration. Moreover, when an even lighter solution is required, the detachable head is easily removed and the legs provide standalone support for up to 25 kg of gear. Its performance is the highest in terms of minimum footprint, for low angle shots, when taking backstage pictures and when placing secondary cameras. Engineered with a brand new (patent pending) Pull & Fix leg angle selector system, it features two leg angles for maximum flexibility and long-lasting rubber feet designed to increase grip on most surfaces. The ergonomic rubberised gear easily locks and controls the strong stainless steel sphere of the aluminium ball head, which is also perfectly compatible with the Gitzo Traveler Tripod, and the Mini Traveler legs can be matched with the smallest Gitzo Traveler ball head. Available in two attractively refined colour combinations, full black and classic Gitzo noir décor, the Mini Traveler boasts Gitzo’s unique, unmistakable finish and design reminiscent of the exquisite shape of the successful Gitzo Ball Heads. The precision machining accentuates the shapes and ensures the strongest aluminium structure and, together with the hard anodic oxidation treatments that protect the tripod surface, makes the Mini Traveler a durable and reliable support for every occasion. Like for all the Gitzo products, each detail of the Mini Traveler revolves around lightweight and high-quality materials, with accurate assembling and fine manual control. The uncompromising attitude of Gitzo crafters is always in harmony with the uncompromising expectations of Gitzo fanciers. B&H has the Gitzo Mini Traveler Tripod available for preorder. 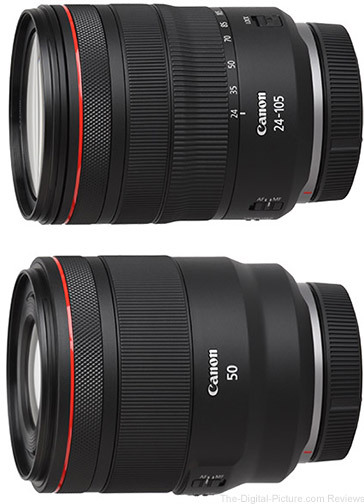 Standard product images along with vignetting, distortion and specs/measurements for the Canon RF 24-105mm f/4L IS USM and Canon RF 50mm f/1.2L USM have been added to the site. The Canon EOS R has also been added to the site's Camera Top View and Camera Back View comparison tools. Click on your current camera's link at the bottom of the tool and then on the "R" to see the size/available features difference between the two cameras. The new C-800-U Spectromaster offers ultra-precise color measuring performance designed specifically for the cine and photographic industries. Developed with the input from leading lighting manufacturers, filmmakers, photographers, and The Academy of Motion Picture Arts and Science and Technology Council, the C-800-U solves the problems image makers have when understanding color properties of light, and how lights will reproduce colors on camera. WHAT MAKES THIS METER DIFFERENT? The C-800-U has more Color Rendering Standards than any other field meter in the industry. It is the first and only meter to include SSI (Spectral Similarity Index) developed by the Sci-Tech Council of the Academy. SSI gives the user the ability to set any light as a standard, or use predefined standards (such as CIE D55), and then gives other lights an SSI score based upon how well they will match. The C-800-U also includes TLCI (Television Lighting Consistency Index), TLMF (Television Lighting Matching Factor), TM-30-15 (Technical Memorandum) in addition to CRI (Color Rendering Index), which can be measured singularly or in two light comparison mode. CRI The new Spectromaster C-800-U takes the great features of the C-700 with the same bold 4.3” touchscreen, and same ability to read LED, HMI, Florescent, Tungsten, Natural Light and Flash from 1,600 to 40,000 Kelvin. Built on its CMOS linear image sensor, the C-800-U is capable of measuring in 1 nanometer (nm) increments to detect spikes using fluorescent or LED lighting. With the same ergonomic button layout, swivel head, and built-in dark slide that enables easy use on set and expands on the C-700-U’s color rendering standards, units of measure and memory. MATCHING YOUR LIGHTS JUST GOT EASIER. The C-800-U now has more color control parameters specifically designed to help match lights to one another. CIE1931 (x, y) has been added, giving users the ability to measure and dial-in specific chromaticity coordinates into lights of some major brands. Hue and Saturation units of measure have also been added to better match RGB LEDs to any light source. In addition, new display screens provide easy interpretation and understanding of the new data fields, making this the best meter for all applications. Make Your Images Pop, FAST! Learn how to add beautiful Radiance to your images in Photoshop using a special Blend Mode. With this Quick and Easy Technique, we'll learn how to add depth and punch to flat boring images. To make this technique even quicker, we'll also provide a downloadable Action. Besides, to enhance the look, even more, Gradient Maps, Curves, and Color Lookup would be of great use. Learn how to export Documents, Layers, and Layer Groups in Photoshop. The Z 7 can now be paired with computers and upload pictures via built-in Wi-Fi. Fixed an issue that resulted in uneven peripheral illumination in wide-angle shots taken with VR enabled. Adjusted some compensation values for NRW (RAW) data. Added support for the Z 7 and Z 6. Added support for the Z 7, Z 6, and D3500. By now, she's actually a couple of weeks old. 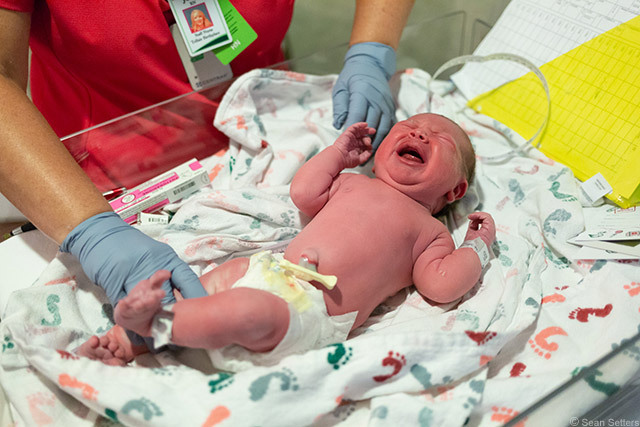 But at the time this image above was taken, Olivia Jane had been breathing air for only about an hour. My life has change a lot since September 11 at 4:50pm, but one thing remains the same – the importance of photography in documenting the world around me. Specific endeavors require specific gear, and lately I've been leaning heavily on certain lenses more than others. Specifically, I've been relying on wide-aperture prime lenses, with their ability to create subject isolation and freeze motion (using moderate ISOs) when second-chance opportunities are fleeting or non-existent. Sharp-eyed site visitors have likely noticed two aspects regarding the kit listed above. The first is that all the lenses I packed were prime lenses. I chose to pack a large assortment of wide aperture prime lenses because I wasn't sure how well lit the hospital would be and the max aperture of my general purpose lens, a Canon EF 24-105mm f/4L IS USM, seemed too narrow to rely on for the indoor event. As it turns out, the room where my wife gave birth was "softly lit for patient comfort" (hospital terminology for "relatively dark") with a couple of bright spot lights illuminating the delivery zone. The wide aperture primes proved essential for maximizing image quality while documenting the life-changing event. When packing the bag, I suspected the longest and shortest focal length primes would be too long/short for effective use in the areas I'd be shooting in during our 2-day hospital stay, and that largely proved to be true. This kit in this bag had two purposes. One, it provided me with a backup camera should something happen to the primary camera in the other bag. Second, it gave me a couple of STM lenses that I could pair with the 7D II should I decided to capture video. Not knowing how much room I'd have to store things in the delivery and post-partum rooms, my plan was to leave this backup camera bag in our car parked in the parking lot and simply run out to the car if I wanted/needed it. Of course, a primary camera failure at a critical time would have left me without an easy-to-access backup, but... thankfully, that didn't happen. In fact, the backup camera bag never made it out of the car. Note: I don't recommend leaving your camera gear in an automobile for long periods of time because of prolonged heat/humidity and chance of theft. In this case, however, I prioritized a less-cluttered hospital room over my gear's safety (the bag was well hidden/out of view in the vehicle). So which lenses did I utilize most during the big event? Unfortunately, the data is a bit misleading. I used the Canon EF 100mm f/2.8 USM Macro to capture lots of close-ups of Olivia's feet, hands, ears, etc. However, without stabilization (and not wanting to push ISOs too high), a lot of those images came out blurry. 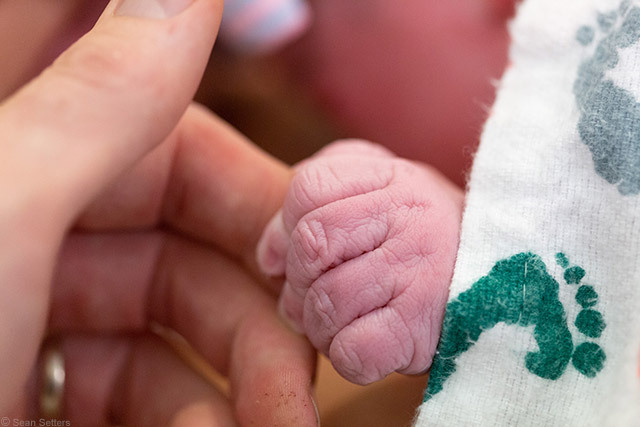 However, I was shooting the macros when I wasn't pressed for time and the baby was relatively content, so I often shot a large number of images for each framing I wanted. In other words, the macro lens was only used for a limited number of compositions, but I recorded many shots of each composition to ensure I got what I wanted. The lens that was mounted to my camera for most of our hospital stay (and just before leaving for the hospital) was the Canon EF 35mm f/2 IS USM. The moderately wide focal length paired with image stabilization made it an extremely versatile lens, able to capture enough slightly-blurry background with the subject to tell a story while remaining easy to work with in relatively tight spaces. The lens' IS system meant that I could use even-slower-than-usual shutter speed when subject movement was minimal, while the wide f/2 aperture allowed me to freeze action even in dimly lit conditions. 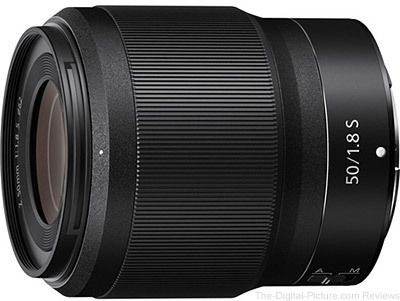 The next most-used lens was the Sigma 50mm f/1.4 DG HSM Art. It was the lens I chose to mount as soon as Olivia saw light for the first time. 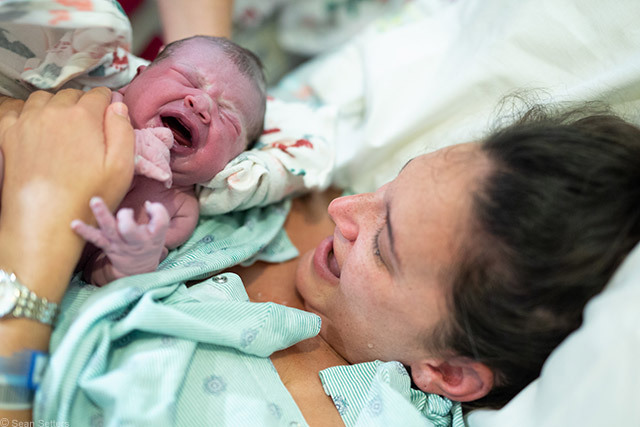 At that point, I wanted to limit distractions in the composition by using a narrower field of view to focus on my wife and baby seeing each other for the first time. A wide-aperture 50mm prime lens gave me the composition I desired along with action-stopping shutter speeds and a relatively low ISO setting. The rest of the lenses I brought were used sporadically, but looking back, I could have sufficed without them. 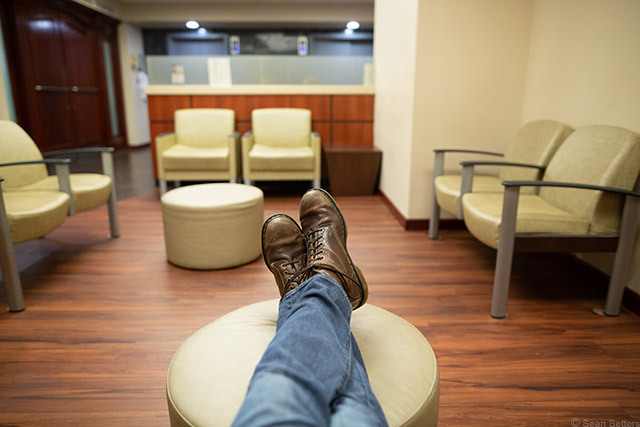 That said, different hospitals may present different opportunities for various focal lengths, so having several available is nearly always a good idea. Could I have gotten away with using only a 24-70mm f/2.8 zoom lens? Maybe, but the max f/2.8 aperture would have required a 2-4x higher ISO to be used to achieve the same action-stopping shutter speeds compared to most of the primes I brought. Also, considering the amount of background distractions found in a typical hospital room, an f/2.8 aperture would not have allowed me to blur those elements quite as much. The downside to primes, of course, is the need to change lenses when a new focal length is desired for the optimal composition. My backpack full of prime lenses proved equally useful after returning home from the hospital. I left it sitting just inside our dining room and would quickly grab the camera for capturing the various "awwww" moments that occurred in our home over following week. It's been two weeks now, and that day is a bit of a blur in my memory. But thankfully, I have a wonderful set of images to look back on to remind me of the way during my child's first few days outside the womb. My photographic style is typically very deliberate, with lighting and/or tripod setups that slow down the capture process. While prime lenses fit well into that kind of workflow, they aren't absolutely necessary as lighting (either added to the scene or recorded via a slower shutter speed) isn't really a problem. 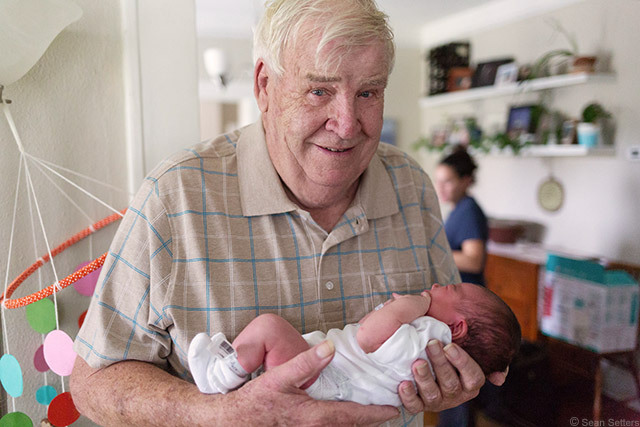 But when documenting life as it happens, what a wide aperture prime lacks in focal length range, it more than makes up for in the versatility and aesthetic afforded by its max aperture. The SIGMA Corporation announce the opening of a new state-of-the-art building at the Aizu factory located in Fukushima, Japan which is now fully operational and dedicated to the processing of magnesium alloy, a useful component that provides toughness and durability for SIGMA Global Vision products while being lightweight. Lightweight is a desirable characteristic for interchangeable lenses and provides an advantage over other manufacturer’s products especially with relatively large mass telephoto lenses. These lenses often use metal parts with high strength and rigidity for exterior parts to securely hold optical elements with a large diameter together as well as to protect the internal parts. Generally the use of metals such as aluminum for this purpose poses a challenge as it makes the product too heavy and therefore difficult to handle. 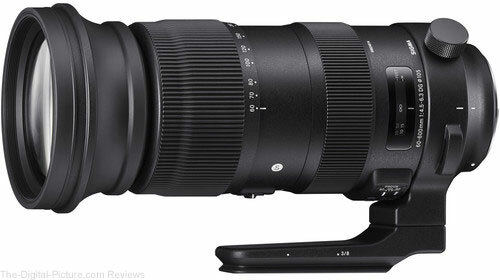 SIGMA has taken this into consideration and adopted the use of magnesium parts processed in-house for the first time with the development of the new 60-600mm F4.5-6.3 DG OS HSM|Sports, due for release in October. The lens achieves lightweight, an attribute which is increasingly sought-after by users, while being tough and durable to ensure lens performance. SIGMA believes it is important to be flexible and act quickly enabling the delivery of unique, surprising, and pleasing products. Its own integrated production system with a high in-house production ratio is essential to meet the demand for small-lot production of diverse products, the demand for which will be likely to grow even more in the future. To intentionally incorporate magnesium alloy processing, which requires rigid safety control, in the in-house manufacturing process, SIGMA constructed a building dedicated to magnesium alloy processing and started operations for mass production, contributing to the stable production of high quality and high accuracy parts at reasonable costs. The magnesium parts produced in the dedicated building will be used for many products in the future including the 60-600mm F4.5-6.3 DG OS HSM|Sports and the 70-200mm F2.8 DG OS HSM | Sports announced at Photokina 2018. We made some important decisions this week concerning Luminar, and we think you’ll like them. We’re always working hard to take our products to new heights, but this last year has been special. We’ve been intensely working on new tools that will elevate Luminar from a supercharged photo editor to THE home for editing, organizing and enjoying your images. It’s been a long time coming, but it will completely change the way everyone uses Luminar. I’d like to give a preview of the big things that are coming… Starting with Luminar Libraries in December, we've got a series of huge updates coming over the next year. A much anticipated addition to Luminar, Libraries will allow photographers to organize, browse and edit images the fly. Libraries will be powerful right out of the gate, but it represents the first of many photo organization and management updates launching over the following months. From Libraries to other killer features, these updates are so powerful, that we want them in the hands of as many photographers as possible. To this end, we're going to do something unprecedented. Through late 2019 (at least), we're making every new feature available to all Luminar 2018 users - at no cost! While software companies typically roll out paid updates every year, there will be no paid updates for Luminar until late 2019 at the earliest. From Libraries to innovative new editing tools, every monumental advance and every new feature will be provided as free updates for Luminar 2018 users. This is a reflection of how much we value our customers, and how confident we are in the incredible value of the features we've got coming! With so much on the horizon, communication is key! Check the blog regularly for updates on all the exciting upcoming features. We look forward to your feedback and support. Thanks for taking this journey with us! As mentioned last week, the new version will be released later this year. Anyone who owns Luminar will get the new update for free in December, if not earlier. This new version is now in a closed beta testing, and the feedback we have been getting so far has been overwhelming. The first version of Libraries in Luminar is all about these main points: performance, comfort, and a complete user experience. This means the new version will give you speed to browse & organize images without the extra wait time. This means that you’ll enjoy your photos moments after you start the software. Here’s a short speed test I did last week. Take a look and stay tuned for more videos, webinars, posts and live sessions about other features. Most importantly, with the new version of Luminar, you’ll be able to conveniently group photos into albums, rate pictures, sync edits between hundreds of images, and do more without the need to check back a manual every time. We spent years, studying the needs, workflows, and preferences of different photographers. So in the new Luminar, you get a truly great viewing/browsing experience that draws you in and helps you enjoy and organize your photos without extra distractions. And since Luminar is already packed with dozens of innovative tools to edit, enhance, and share photos, you will soon get the most comprehensive and well-rounded photography experience available in a piece of software. No paid upgrade. You will get all the great stuff for free. Alongside the new Libraries feature, we also poured a lot of hard work, time & research to bring you new editing tools for portraits, landscapes, aerial and other genres of photography; new features powered by Artificial Intelligence, new looks and styles, and more. We have initially planned to release those features in Luminar 2019, as a paid upgrade, just like we usually do. However, this week, we made a decision to forgo any paid upgrades at least until the end of 2019, and add those features to Luminar 2018 for free. We will incorporate the new tools and features in the latest version of Luminar instead of asking you to pay for the upgrade. Expect first updates as soon as this year. And throughout the next year we will be frequently rolling out more free updates to make Luminar Libraries, and its Editing & Sharing tools faster, better and more powerful for you. A new price for a limited time. Skylum's software are priced so that everyone can afford them and designed so that everyone can easily use them. We do this because everyone takes photos, not just experienced and pro photographers. We do this because photos are more than just the captions they come with. We believe that every single person deserves to make his/her photos look their best without the extra hassle and without having to study and master all those photo editing tips the pros use. So for a limited time, Luminar will be available for just $59 for new users who have yet to purchase the software. For this price, you’ll get the current version of the software, the free update to the new version that boasts Libraries, and free updates for the new features we initially developed for Luminar 2019. No subscriptions. No upgrade fees. No extra charges. 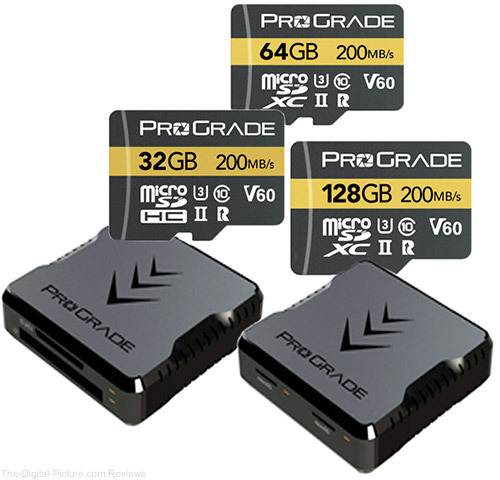 COLOGNE, Germany – photokina – ProGrade Digital, founded with a mission to provide the highest quality professional grade memory cards and workflow solutions, expands product range with introduction of professional grade microSDXC memory cards, plus two USB 3.1, Gen. 2 dual-slot workflow readers. New ProGrade Digital microSDXC UHS-II, U3, Class 10, V60 card delivers maximum read speed up to 200MB/s and maximum write speed up to 80MB/s. Video Speed Class V60 tested and certified, the card’s sustained write speed will not dip below 60MB/s, which ensures no dropped frames during video recording. Company also announces microSD Dual-Slot Card Reader, plus CompactFlash & SD Dual-Slot Card Reader. Booth readers support USB 3.1, Gen. 2 protocols and offer data transfer rates up to 10Gb/s (1.25GB/s). Products available Q4 at Amazon.com, B&H Photo and Video websites. ProGrade Digital products now shipping to 27 European countries via Amazon and Amazon Prime. 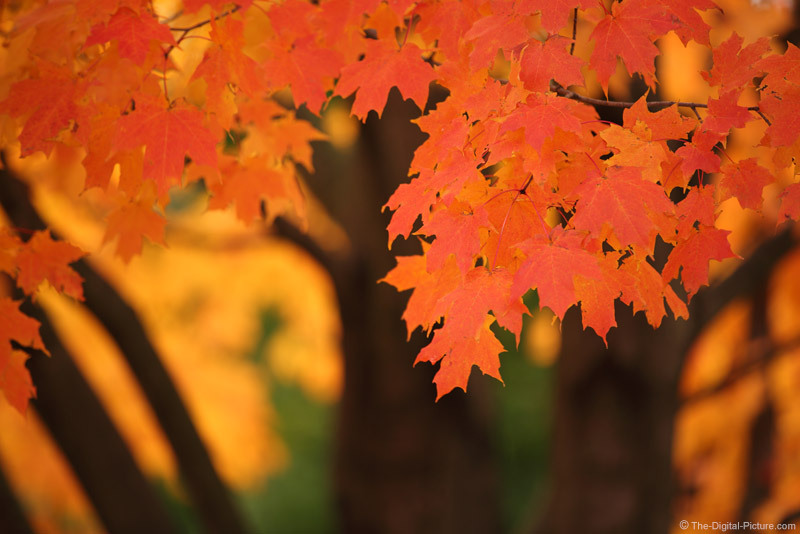 With fall officially upon us, now would be a good time to check out our Fall Photography Tips to ensure you don't miss the great opportunities this colorful season brings.